I usually bring a minimum of 3.Most will say its overkill, but its just me and I would rather have a spare or 2 then be stuck eating cold food. Years ago I went camping with an ex girlfriend. Her Brother lent us a propane stove( Camp Trails) and it died. I don't know what if any maintenance he performed on it, but it stopped working. 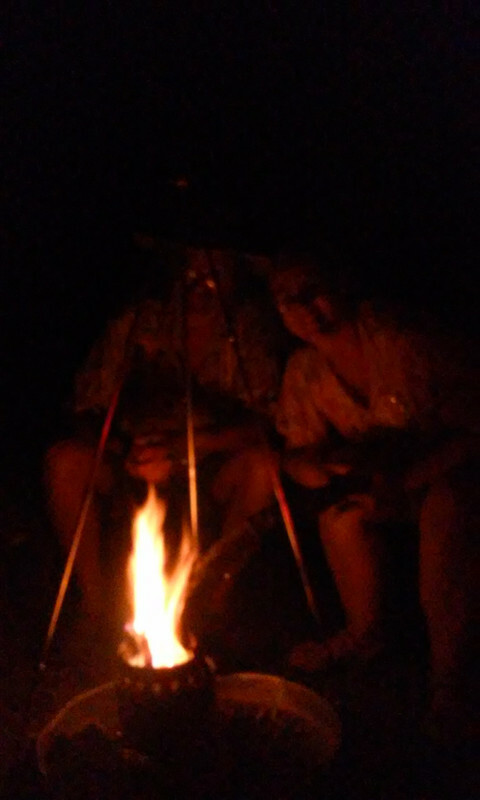 Thankfully I bought a MSR Whisperlight stove with us or we would have been hungry as it rained the whole time we were there and a campfire was out of the question. 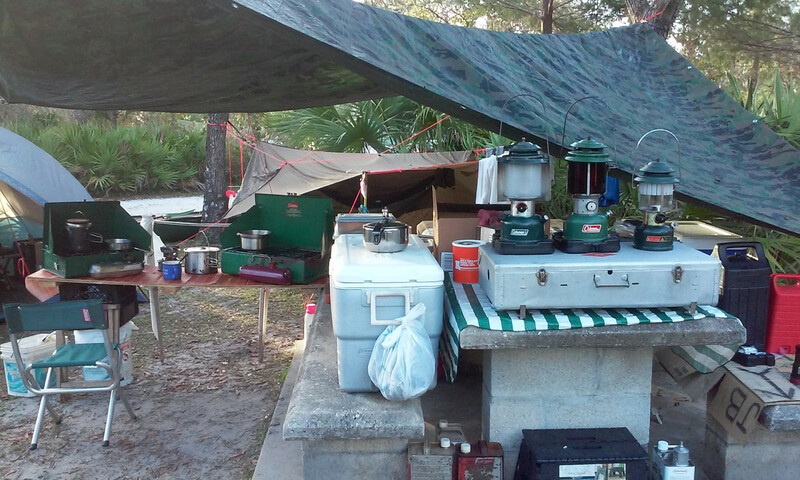 This year by myself, I will bring a Coleman 424 Dual fuel,a MSR Dragonfly, and an Optimus 111 T.
I bring only 1 stove and most of my lanterns, usually 7. My 426D goes on every car camping trip, but I also have an MSR Reactor and a Pocket Rocket as backups in my kitchen box. That Reactor boils water in no time flat too, so it's my usual stove for coffee. I take a 3 burner as my primary, and have a two burner lp stove that came with the popup as backup. 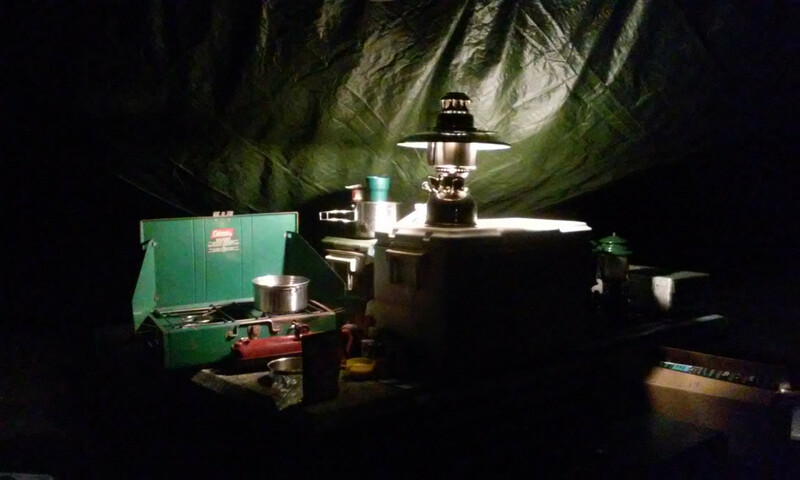 Never have used the lp, the 426d(5-67) just keeps going and going and....the stove is used for two meals a day plus heating dish water. I usually refill it on the third or fourth day. Lanterns on the other hand, I take 4 or 5, and burn 2 at the beginning of every night and turn one off after the dishes are done. 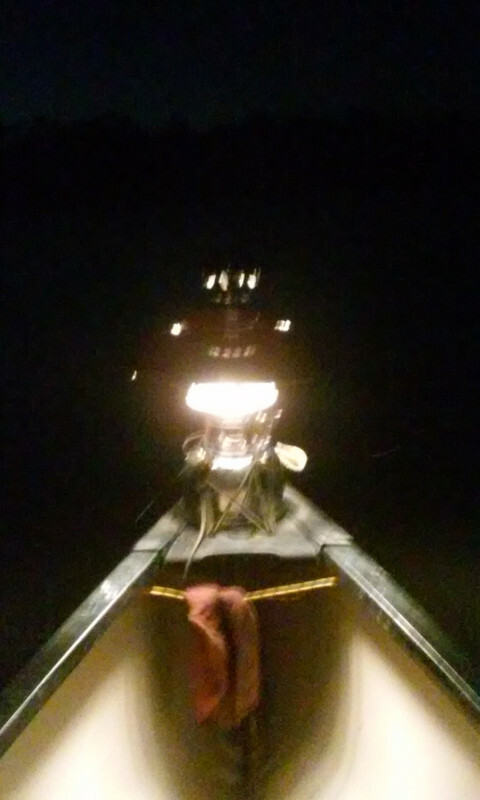 By the end of the trip, each lantern has had at least a half tank of fuel run through them. I'm finally home after camping in PA at the campground I been going to since 1972. 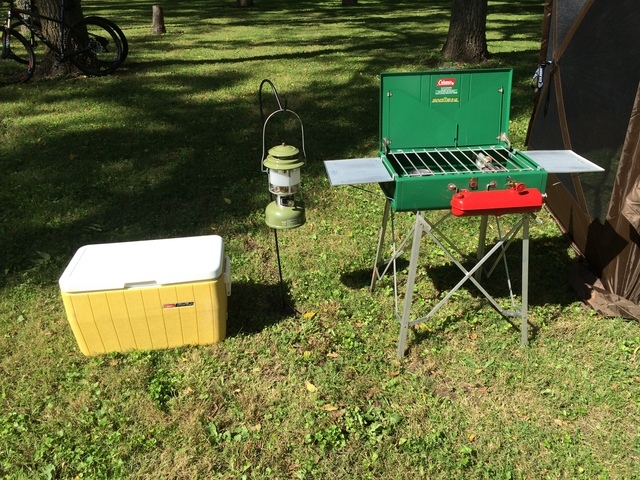 I bought my Coleman 424 dual fuel, an Optimus 111 T kerosene stove, a MSR Dragonfly and a Coleman 533 duel fuel stove. The Coleman 424 I think needs the generator replaced as I don't think it really got hot as quick as in the past. 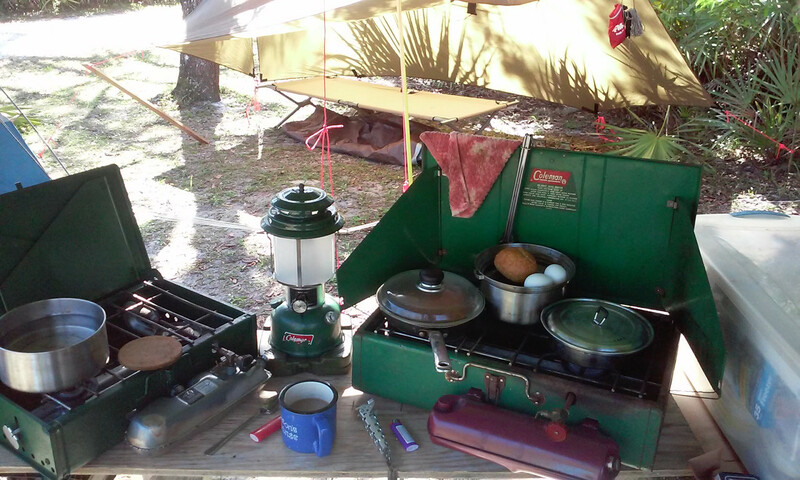 The stoves all did well except the Optimus 111T .The last morning there after breaking down camp, I went to prime the stove and then light it, but it wouldn't settle down and produced big orange flames. Frustrated I got the Coleman 533 stove out and after playing with the flame, was able to boil water for coffee and oatmeal. When I got home the Optimus stove jet needed a good cleaning and was also loose. Works well now. Mostly people with their campers had the stock stoves and outdoor grills, I saw some people using little butane stoves that were tent camping. The temps got down to 46 so they must have had some fun lighting them. When backpacking it was always just my Primus Gravity MF. Now that we mostly car camp, it's an 18" Weber Smokey Joe plus the Primus. Our next trip out will be an extended journey, including hotels and camping. The Primus will be along, but to save space the Weber will be replaced by my 413G. I'll have to see if the convenience of the 413G outweighs the cooking flavor of the weber for future trips. 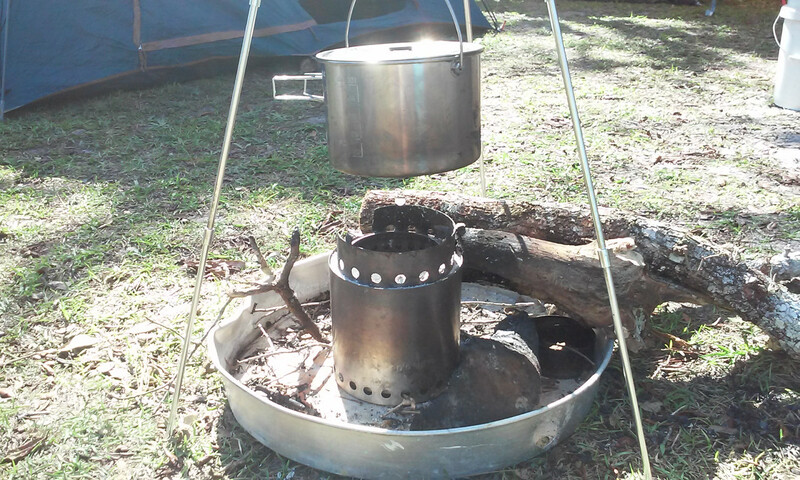 I used a Coleman two burner stove just this week --the cheap one without the wind guards and it was amazing. Best $40 I spent this year. I'll eventually upgrade but my son and I enjoyed good hot food all week with it. 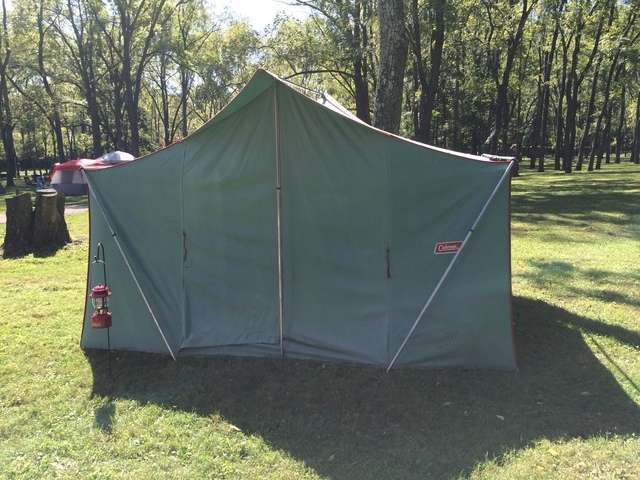 I can't believe I've been camping without one for the past 10 years! Always 2 and sometimes 3. If it is hunting season I bring a 502 in can to pack with me so I can have a hot lunch if I want climbing all over the mountains. Lanterns. At least 4 if not 6 or more. 3 stoves, 2 lanterns. Usually 413E, 425 NL, and a one burner(502, 400, or 500). Lanterns are usually 228B and Northstar. If it's cool enough to sit by the fire and read, we use a Aida kerosene with reflector. I was bringing one then I picked another one up at the Ohio gathering so now I bring two. We use only one though. I bring two - one suitcase and a 502. The 502 is used for frying up anything that will spatter all over. I bring three: 425 suitcase for the campsite, and a 550B if I want a hot meal on a day hike. I also bring an F1 Ultralite as a backup for both. 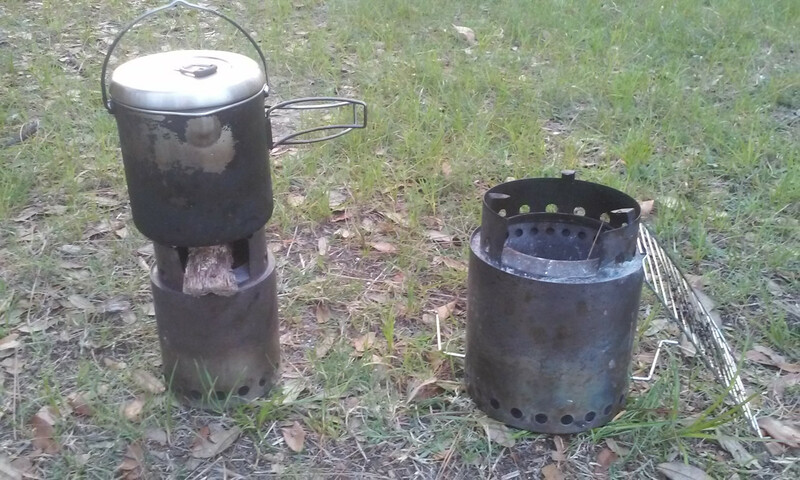 My buddies and I do our annual trip and we have starting taking two stoves. One is a Coleman propane that one of my friends has the other is a slightly used 425 that my brother grabbed off the curb during trash day. It just depends on the situation. 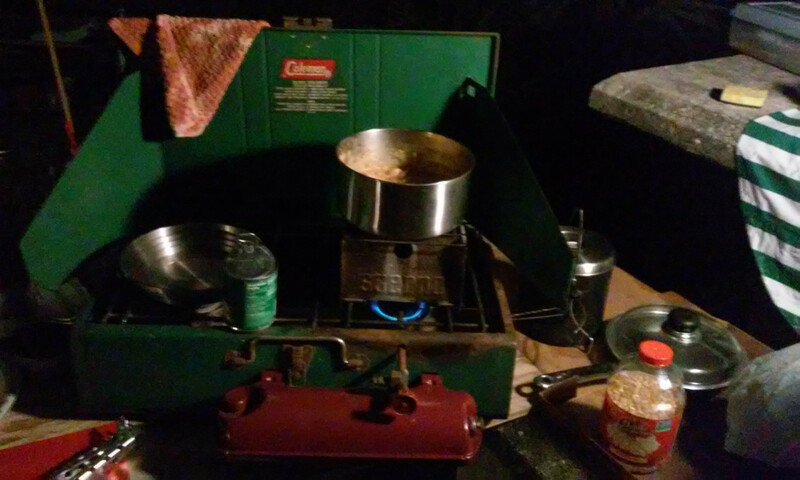 For cooking inside our homemade camper we have the mic and the hot plate, then we have a propane single burner, 425, a 502, and the wife has her pink picnic stove to for outside cooking. 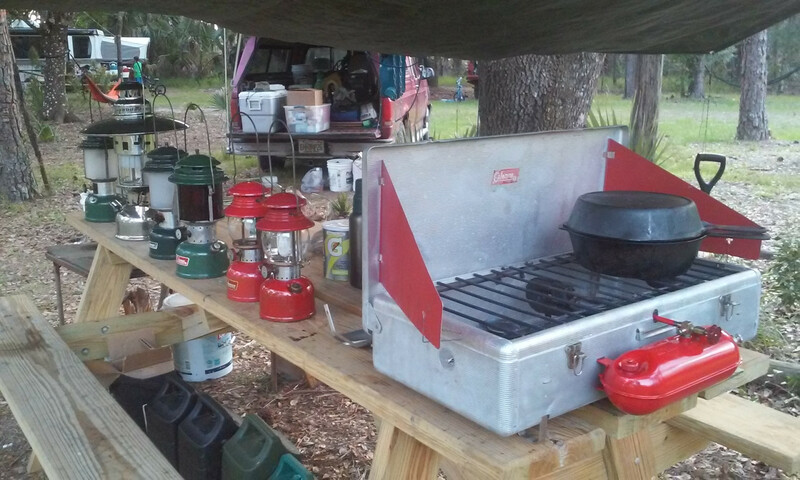 We also bring our smokey Joe and our campfire cooking set that we got at one of those reenactments from the early 1800's. Would like to add one of those cowboy coffee pots and a tilt hanger for the fire to our camping equipment. 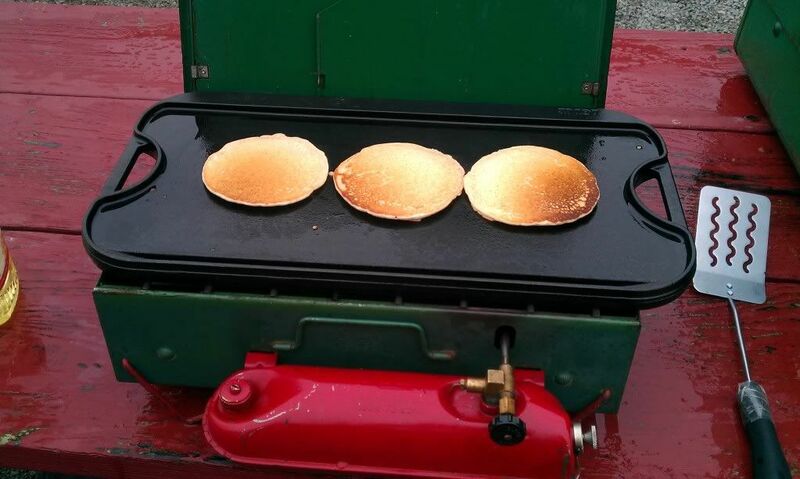 I bring one - a triple burner, --> one burner for coffee, one for bacon/home fries and the third for eggs "over easy." I have trusted it firmly for the past 20 years that I don't bring a back-up. JIM MULL - from Jersey: #7 in Sears, #115 in Turds, #1948 in Mil-Spec, #48 in BernzOmatic, #1 in Cecilia's Heart. For actual cooking, I take a 3-burner and a 2-burner, plus a propane single for delivering major heat to a percolator when you can't move very good because you haven't had coffee yet. I usually take another 2-burner for backup, since with 50+ year old stoves that I've been working on, chances of them working without more tinkering is 50/50. Usually a simple problem that could be fixed in the shop in 60 seconds, but can't be fixed in the field. When you've got eggs in one pan, bacon or sausage in another, potatoes in a third, maybe a griddle taking up two burners, and a big pot of water simmering for dishwashing later, you run out of burners fast. In the beautiful Sorrento Valley, between the towering snow-covered peaks of Mt. Dora and Mt. Plymouth. Sometimes it looks like this. 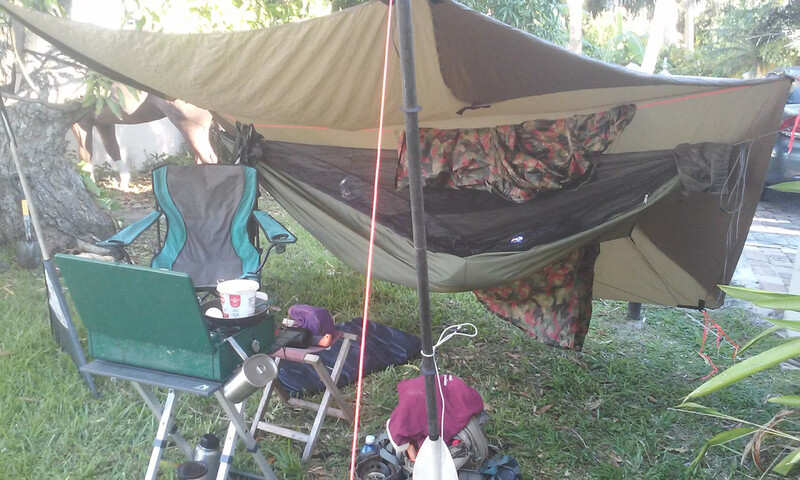 433 Three burner, a few lanterns and a hammock to rest in covered by a tarp. 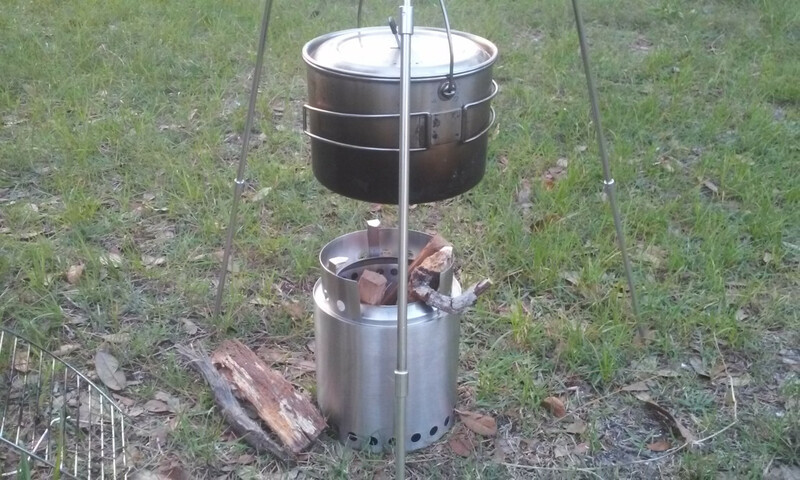 This lantern has the cook stove top installed, top reflector and the vent rests on top of the stove top when not cooking. Shown below with a Coleman 288/286 picket fence frosted chimney. A few more lanterns in this shot I think. 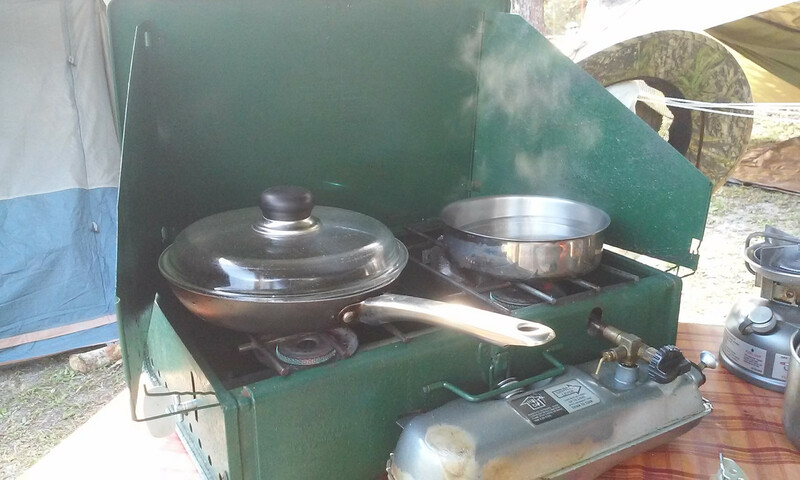 I always bring two wood burning cook stoves for when the conditions are right and fuel is available. Sticks & Twigs an' Stuff. Below, getting ready to heat some hot water for coffee. Once the fire lighting procedure is perfected using a wood fired cook stove is lot's of fun. 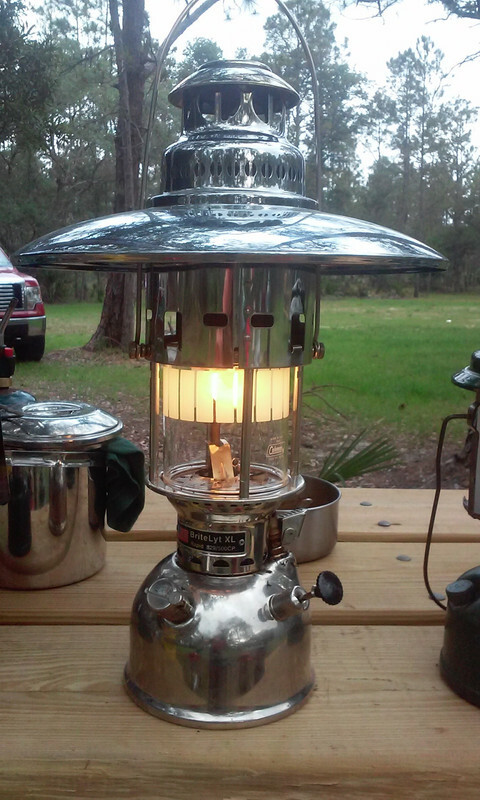 Always have your fire tinder dry and ready for the next fire and it's as easy as lighting a Coleman stove. The two burner 425NL makes great coffee and works well with the toaster. Repainted bronze with copper fount and wind guards. Don't forget to leave a light on in camp so you can find your way back! Those side reflectors help a great deal to reduce being blinded at night. 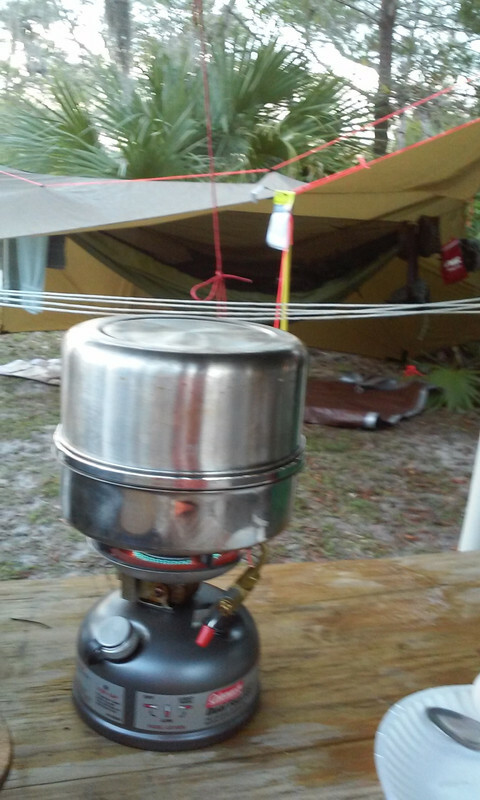 Below, I showed this photo to see how I sometimes use a "Sterno Stove" for keeping pots warming. 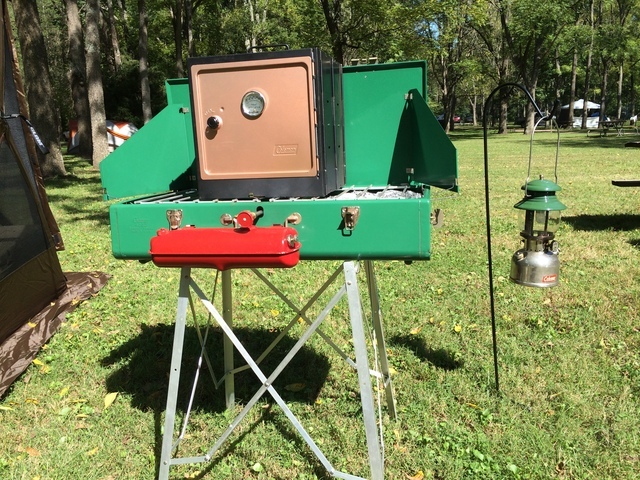 To summarize, Two Solo Wood Stove, the Titan and Campfire models. Sterno folding stoves for many uses including. 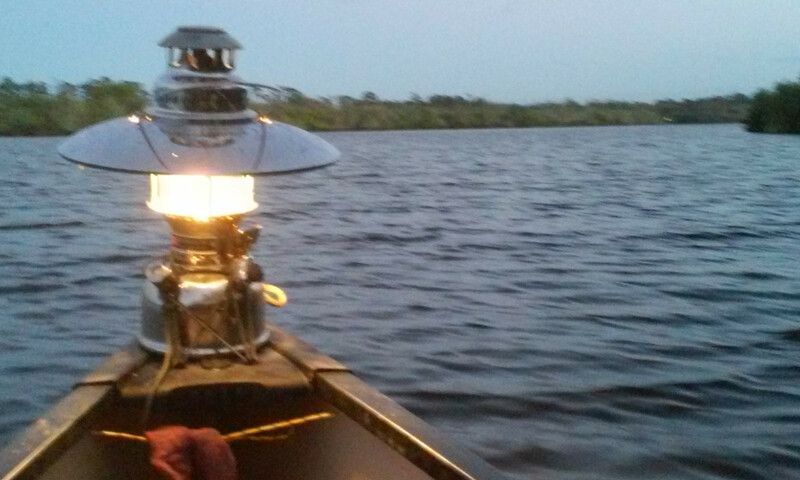 lantern stands close to the stove when no hanger is available to raise the light up, simmer ring to raise the pot higher above the flame for warming and grilling. Coleman stoves 433 three burner aluminum, 413G, 425F and 533 stoves on this trip. They all have there uses and add to the enjoyment and versatility of the activities of the trip. Lanterns on this trip: 288, 295-700t, Britlyt 500CP Third generation XL, 220J, 220F. 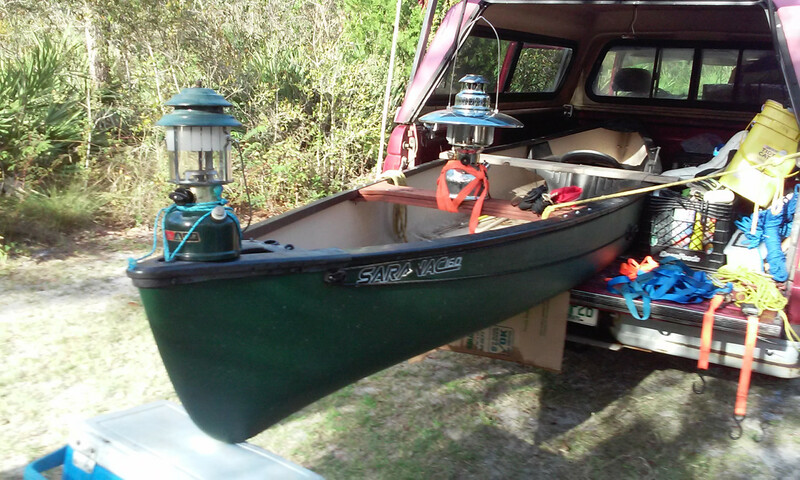 Lantern on the canoe with the large top reflector Britlyte 500CP XL third generation burning diesel. Burns much cleaner than RUG, regular unleaded gasoline. The diesel gets hot enough to burn more completely and extend the life of the upper vaporizer. 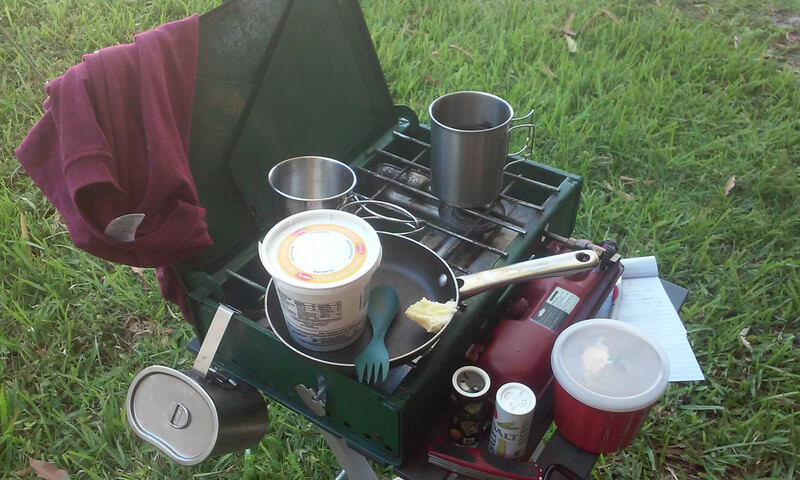 A 425F with a canteen cookset that also includes the twig stove and an alcohol stove not shown. The alcohol stove with the canteen cook set makes a great trail cook system for quick hot drinks in the winter while camping or hunting. 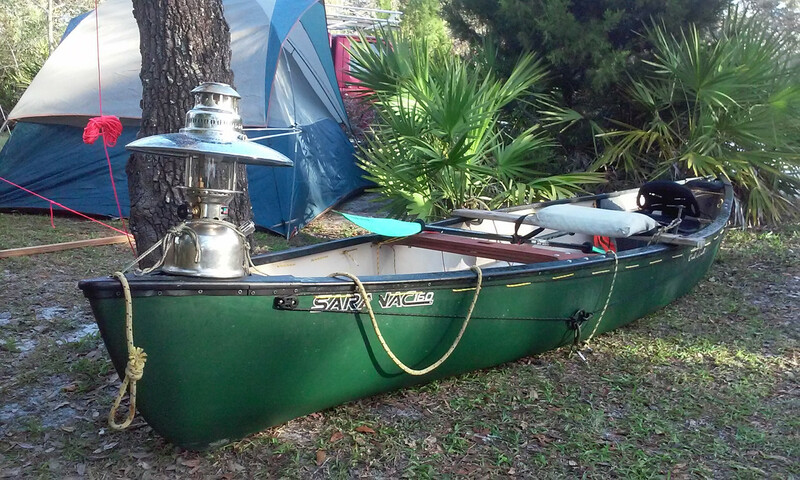 I have used both stoves in the canoe when conditions allow. Keep some cooking oil and dry batter for the fish. Catch and Cook! I have three canoe kits pre-packed at all times. 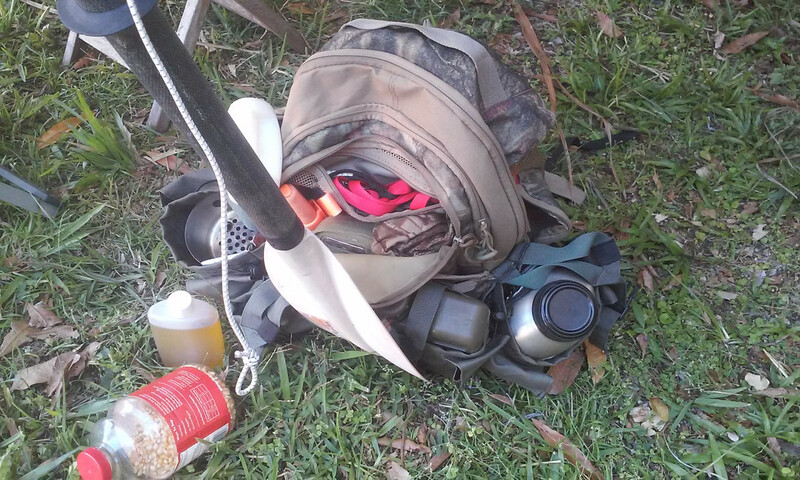 2) Single Over Nighter: This means a dinner and a breakfast, plus a possible hot lunch because I like to use my gear, even though I could just slap together a sandwich. So, the 533 or the 442. 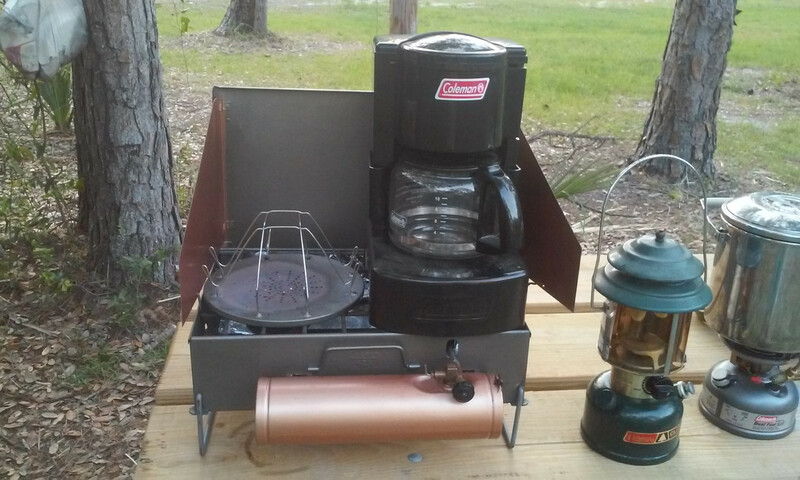 I'm going to start bringing my Stern-O folder and a pop can alcohol stove for morning coffee The latter starts easy in a tent without having to pump or prime for my coffee water. Heats 14-16oz hot enough in about 6 minutes. Just strike a match, no pumping so I can laze in the sack awhile. 3) Weekender or more: Now that I've acquired an old but worthy 425E, that'll come along regularly. Plus either the 533 or the 442. I also always bring my DIY reflector oven for fresh bannock and other goodies. Of course, there is usually a cook fire going as well, which I take full advantage of. Add the Stern-O folder. For many years I only took my 414 suitcase stove. Then one year the check valve went bad after a rainstorm. I didn't have the spare parts, know how, or tools I have now so I had to share a stove with a neighbor. Now I always have a 502 or a 442 as backup. Experience is the best teacher! Two stoves and two lanterns so I have a backup of each. I used to take multiple stoves. But, Coleman stoves are so reliable, I seldom used more than one. 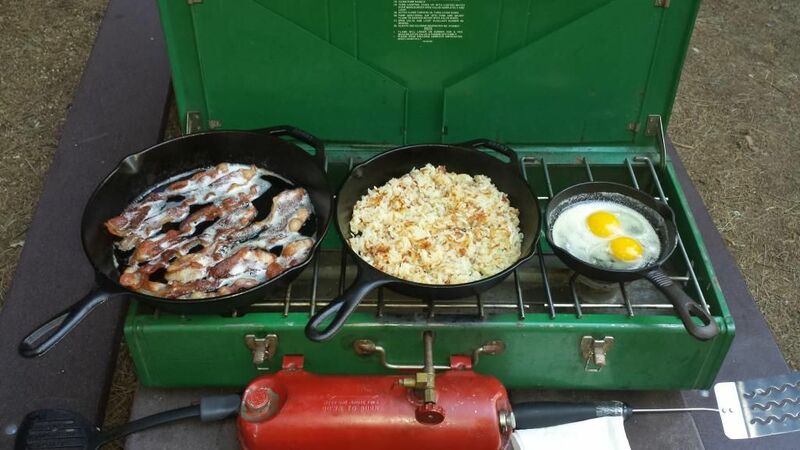 I fuel up my 413G user stove at home before the camping trip. Then I run the stove at home. If it works well, that is the one that I take. I also stopped cleaning my stoves thoroughly after a camping outing. I just do a little wipe down to remove the gross debris. I find that the grease acts as a preservative - it prevents rust on my user stove. Sometime, I will take an extra 500 for coffee. Ah, I thought you were looking for one. 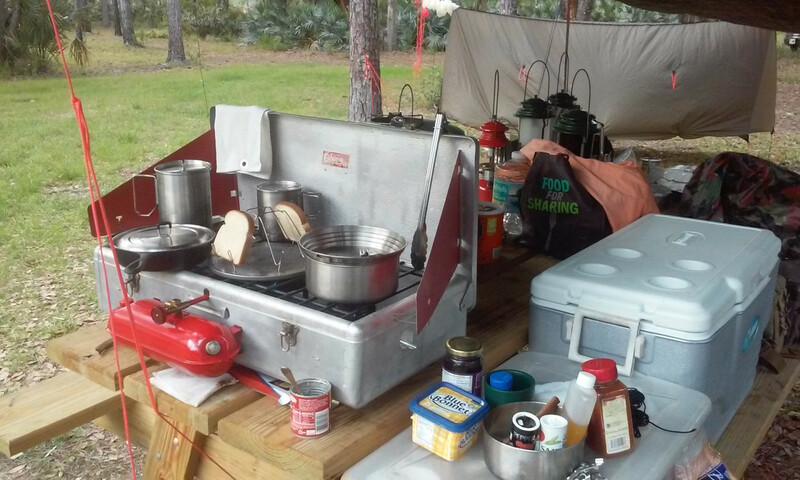 For the last several years my two burner Camp Chef clone has been my main stove. I like the 30,000 BTU burners. I often take a 425 or 413 with as well. One, since it's all I got. But....that britelyt xl is very tempting. usually 2 stoves, 3 lanterns. WTB: Sears Lanterns !! PM me with what you have for sale.. I only carry one, either a single burner when I go by myself, or a 413 when I go with the family, I really like the 426, but can not justify the extra weight and size when we go to remote camping, so I only use that one at home. 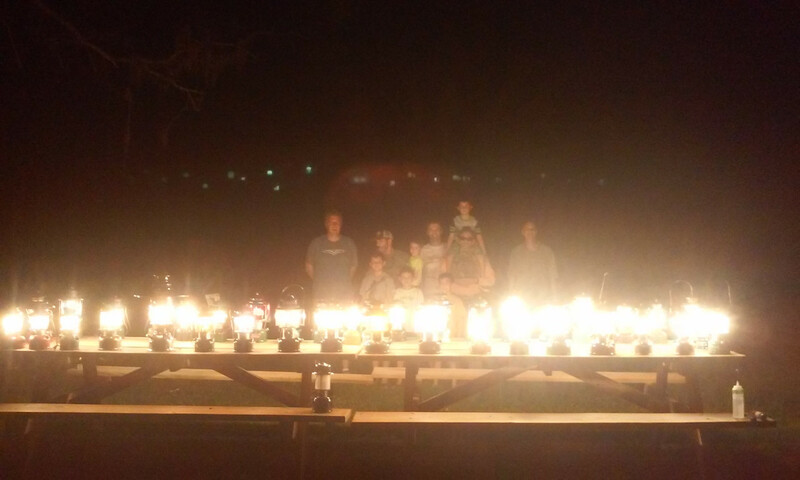 If you need a Sun Flame Generator Model 100-107 ( for Sunflame lanterns models 105, 106, 107 and 110) give me a PM, I have close to 80 of those, 15 bucks each. Since we empty nested I take 1. I always take my 426 no letter. It is the one that started it all for me, my first coleman collection buy. 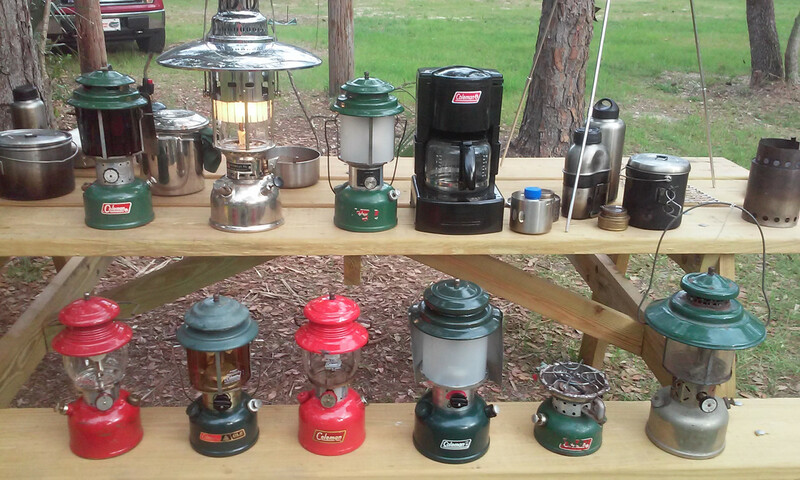 We even have an RV camper now but I will always take that stove and one lantern. 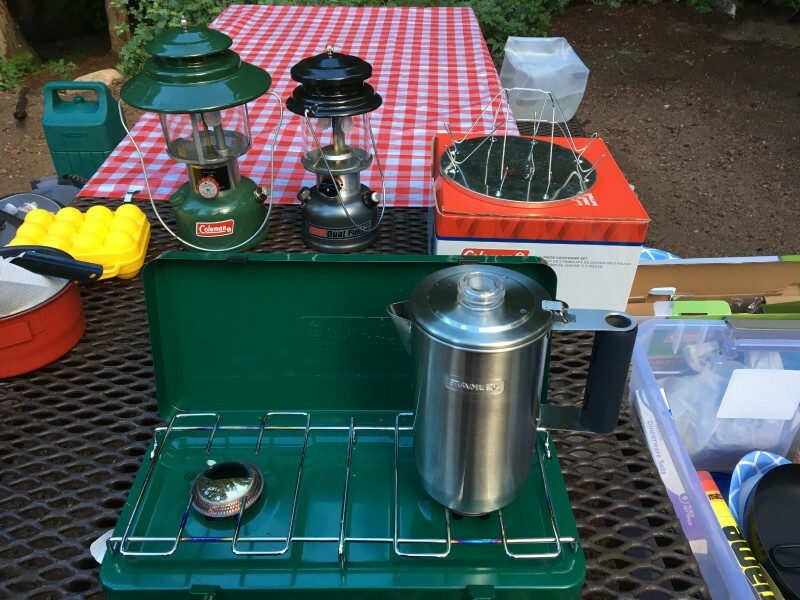 "The smell of naphtha triggers my OCD collecting..."
I camp a lot with a large group of YMCA Indian Guides, so I usually bring one Stove, and a 3 burner cast iron Propane hotplate. Three 4-1/2 inch low pressure burners, 15,600 BTUs per burner. I run the hotplate off of a 20-lb with a riser and a profane lamp on top. Gives light, and plenty of cooking space for a large meal. 426B w/adjustable leg slots,(replaced the one in pic). 425C for 20" griddle, O-Grill clamshell for grilling.